Built in 1980, by Main Iron Works of Houma, Louisiana (hull #355) as the Pacific King for the Swire Pacific Company of LaGrande, Oregon. 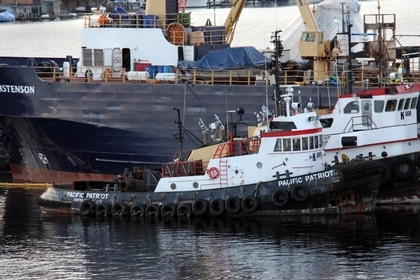 In 1997, the tug was acquired by the Foss Maritime Company of Seattle, Washington. Where she retained her name. In 2004, she was acquired by the SeaCoast Transportation Company of Seattle, Washington. Where the tug was renamed as the Pacific Patriot. In 2006, the SeaCoast Transportation Company was acquired by the K-Sea Transportation Partnership Incorporated of East Brunswick, New Jersey. Where the tug retained her name. In 2014, she was acquired by Marine Express Incorporated of Walnut Springs, California. Where the tug retained her name. Powered by two Caterpillar diesel engines. The tug is fitted with kort nozzles, and flanking rudders. She was a twin screw tug, rated at 2,000 horsepower. The tug's capacities are 26,000 gallons of fuel.